Two shot groupings obtained with different firearms at different distances. The group on the left measures about 13 mm and was fired at about 45 meters, which equals 13 mm/45 m = 0.29 mils (​1⁄2 in group at 50 yards, approx. 1.047′×50/100 = 0.524′). The group on the right measures about 7 mm and was fired at about 90 meters, which equals 7 mm/90 m = 0.08 mils (0.3 in group at 100 yards, approx. 1.047′×0.3 = 0.314′). In shooting sports, a shot grouping, or simply group, is the pattern of projectile impacts on a target from multiple shots taken in one shooting session. The tightness of the grouping (the proximity of all the shots to each other) is a measure of the precision of a weapon, and a measure of the shooter's consistency and skill. On the other hand, the grouping displacement (the distance between the calculated group center and the intended point of aim) is a measure of accuracy. Tightness of shot groupings are calculated by measuring the distance between bullet holes on the target (center-to-center) in length measurements such as millimeters or inches. Often that measurement is converted into angular measurements, such as milliradians (mils) or minutes of angle (MOAs), which expresses the size of shot spreads regardless of the target distance. Thus, by using angular measurements, one can reliably compare the relative tightness of shot groupings fired at different distances. For firearms that shoot one round at a time, a shot grouping test can be used to measure the accuracy of the entire shooting system: the weapon's mechanical precision and the uniformity of the ammunition. The weapon is fixed into position on a test mount, and aimed at a target. Multiple shots using rounds from the same type and batch are fired to observe how the weapon groups the shots. If a person holds the weapon and shoots it, the grouping measures the combination of the person's skill and the weapon's accuracy. In shotgun shooting, the grouping is also called the pattern. The pattern is the spread of shots from a single shotshell, measured as the smallest circle containing all the shots on the target. The barrel of a shotgun is designed to deliver a wide or narrow scattering, depending on the expected use. Shooting at close range indicates a cylinder bore barrel to deliver a wide grouping, while for hunting at longer distances such as 50 yards or meters, a choke is recommended for to constrict the scattering for a tighter grouping. In archery, a shot grouping is the result of one person shooting multiple arrows at a target. A tight grouping indicates consistency in the archer's form. Diagram illustrating the relationship between distance, group size on the target (subtension) and angular group size. Mean point of impact (MPI) is the calculated center of the grouping, which is the average center of all the shots, and is not necessarily located at a hole in the target. The process of mechanically readjusting the gunsight’s point of aim to match the MPI is called sighting in or “zeroing” the aim. 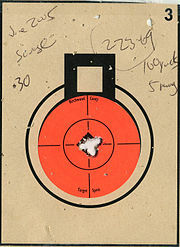 The size of the grouping is described as the diameter of the smallest circle that can be drawn to contain all the shots. A "flier" is a shot from the same shooting session that is farther from the general grouping, considered to be the outlier of the group. Such shots may be the result of an unexpected gust of wind causing drifting, a muscular flinch of the shooter at the time of the trigger pull, a problem with the firearm mechanism, or inconsistency in the ammunition. Single fliers may be discounted when evaluating large groupings, but if fliers occur often, then the problem should be traced to its origin. 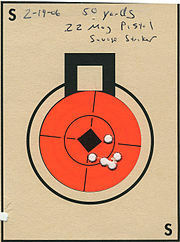 While target shooting with a handgun, if a grouping is consistently off-center then the shooter is instructed to alter the body angle or the stance, rather than shifting the arm, wrist or hand, which should remain in position. When using SI units, shooting accuracy is more easily measured in milliradians by measuring the group size in millimeters (or in centimeters and multiplying by a factor of 10) and dividing by the range measured in meters. Since shot grouping are small angles, the linear formula above can be used as a good approximation for group sizes in mils. The error of assuming that 0.1 mil equals 1 cm at 100 meters is about 1 × 10-7 (or 0.00001 %). When using imperial units, shooting accuracy is more easily measured in minutes of arc (symbol ′, sometimes called "minutes of angle" or "MOA" for short) by measuring the group size in inches, multiplying by a factor of 100 and dividing by the range measured in yards. The linear formula above for measuring group sizes in arcminutes is less precise than using milliradians together with metric units, but can still be a good approximation depending on the demands for precision. The error of assuming that 1′ equals 1" at 100 yd is about 4.5 %. When shooting at a target 100 yards away, 1′ is a circle of approximately 1.047 inches in diameter, while at 100 meters, 1′ is approximately a 29.1 millimeter circle. The arcminute is an arc-based measurement, with 1′ equal to one minute of one degree. The two-dimensional circle surrounding a shooter always has 21,600 arcminutes because there are 60 minutes in each degree, and 360 degrees in the circle. A big-game hunting rifle is considered accurate if its shots fall within 1.5′ (≈ 0.5 mil), while a rifle intended for small animals is expected to have an accuracy of 1′ or less (under 0.3 mil, also known as "sub-MOA"). Handguns are typically less accurate; at a shooting distance of 25 yd, a grouping is considered acceptable for self-defense if the shots fall within a circle of 4 to 5 inches, which is 15′ to 19′ (equivalent to a grouping of 100-150 mm at 25 meters, which is 4-6 mils),, representing the shot pattern needed to hit the vital organs of a human target. Expensive and well-machined match-grade pistols demonstrate a higher accuracy than normal handguns, capable of groupings of 1.25 inches at 25 yards, which is about 5′ (equivalent to about 30 mm at 25 meters, which is 1.2 mil). With the increased element of human skill in archery, a grouping on target is more a measure of the archer's skill. If an archer is not getting a consistent grouping, then their basic form needs work. If an archer's arrows are grouping on target but off center, this shows consistent basic form, with better results achievable after slight adjustments. On the equipment side, bow stabilizers have been used since the 1960s by tournament competitors and by bow hunters to counteract the torque of shooting the arrow. A tighter grouping may be achieved with such a stabilizer, which adds mass extending outward on a moment arm, usually mounted perpendicular to the bow riser, aligned with the arrow path. ^ a b Matunas, Edward (2003). Do-it-yourself Gun Repair: Gunsmithing at Home. Woods N' Water. pp. 65–6. ISBN 978-0-9722804-2-6. ^ a b c d Watson, David (2014). ABCs of Rifle Shooting. F+W Media. pp. 196–8. ISBN 978-1-4402-3897-0. ^ Moller, Cliff. "Understanding Shotgun Chokes, A brief explanation by Briley". Briley Manufacturing. Archived from the original on July 29, 2015. Retrieved August 10, 2015. ^ a b Engh, Douglas (2005). Archery Fundamentals. Human Kinetics. pp. 72–3, 86. ISBN 978-0-7360-5501-7. ^ Gilbert, Randall (2003). A to Z Guide to White-tailed Deer and Deer Hunting. Woods N' Water. p. 87. ISBN 978-0-9707493-9-0. ^ McDougall, Len (2013). The Self-Reliance Manifesto: Essential Outdoor Survival Skills. Skyhorse. pp. 172–75. ISBN 9781628733006. ^ McGivern, Ed (2007). Ed McGivern's Book of Fast and Fancy Revolver Shooting. Skyhorse Publishing. p. 214. ISBN 978-1-60239-086-7. ^ Campbell, Robert K. (2009). The Gun Digest Book of Personal Protection & Home Defense. Krause Publications. p. 31. ISBN 978-0-89689-938-4. ^ Shideler, Dan; Sigler, Derrek; Ramage, Ken (2008). The Gun Digest Book of Tactical Gear. Gun Digest Books. p. 87. ISBN 978-0-89689-684-0. ^ Haywood, Kathleen; Lewis, Catherine (2013). Archery: Steps to Success (4 ed.). Human Kinetics. p. 42. ISBN 978-1-4504-4468-2. ^ Bertalan, Dan (2013). The Traditional Bowyers Encyclopedia. Skyhorse Publishing. p. 293. ISBN 978-1-62873-012-8. ^ Haywood and Lewis 2013, p. 15. ^ Ruis, Steve; Stevenson, Claudia (2004). Precision Archery. Human Kinetics. p. 131. ISBN 978-0-7360-4634-3. This page was last edited on 8 March 2019, at 17:41 (UTC).